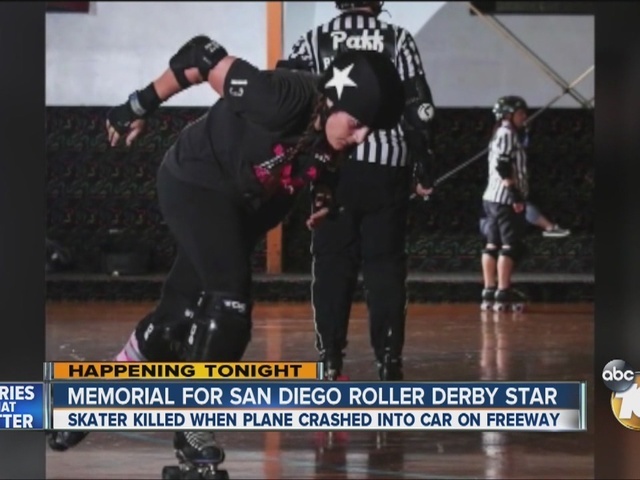 SAN DIEGO -- A memorial was held Monday night to remember a 38-year-old roller derby skater killed when a small plane crashed into the car in which she was a passenger on Interstate 15 in the Fallbrook area over the weekend. Antoinette Frances Isbelle, a Starlettes team member who skated as "Rockalishous," was in the backseat of a Nissan sedan that was struck by the troubled Lancair IV single-engine plane as it was attempting to land alongside the freeway near Old Highway 395 Saturday morning. The car's driver had momentarily pulled to the roadside to sync a Bluetooth device, authorities said. “She was a really loyal friend and she was always there for anybody who needed her at any time, at a drop of a hat. She would stop what she was doing and help out,” Robinson said. “It’s so sad. I feel so bad for her dad. She was the light of his eyes and he was the light of hers,” she said. 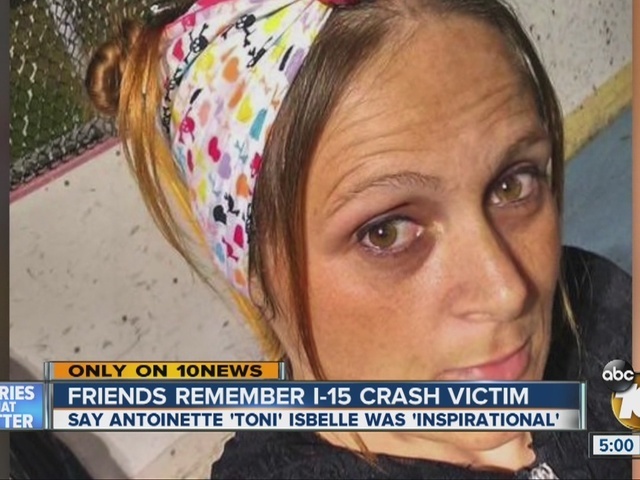 Isbelle’s uncle, Alan Sykes, told 10News that Isbelle’s mother was also killed in a freak accident 10 years ago when she was hit by a car walking across the street in South Bay. Isbelle’s father raised her, Sykes said. Robinson said Isbelle got into roller derby six or seven years ago. “I came a couple of times and she would be out there on that thing going around. We’d be hollering, ‘Go Rockalishous, go!’” Robinson said. Isbelle was number 13 on the Starlettes. “As a player she always was team first, always asked what I needed her to do, took a step up when I needed her to,” team captain Brett Stang said. “She is a tough cookie, for sure, no doubt about that, for sure,” Robinson said. The memorial was also a fundraiser for them. “The medical expenses, their families, they are the supporters, the caregivers,” teammate Erin Sheppard said. Toni’s number, lucky 13, was retired, Robinson said. Three other local roller derby skaters were injured in the crash, along with the plane's 62-year-old pilot and 50-year-old passenger. The San Diego Roller Derby identified the three skaters involved in the accident using their nicknames Rowdy Rodbuster, Vanilla Gorilla and Witchy Wife. Tonight's event at Skateworld San Diego in Linda Vista will also raise money to help in their recoveries. "In the aftermath of the tragic accident involving members of our San Diego roller derby community, we want to honor our fallen teammate and support our injured derby family during this difficult time," roller derby officials said in a statement. Several people who witnessed the crash told investigators they didn't hear anything that would indicate engine trouble, but the way the plane had banked was a sign of trouble, according to fire officials. It's landing gear had apparently not been deployed. The National Transportation Safety Board has launches an investigation into the plane crash. A preliminary report is expected this week, but it could take authorities up to a year to complete their investigation, according to NTSB spokesman Terry Williams.